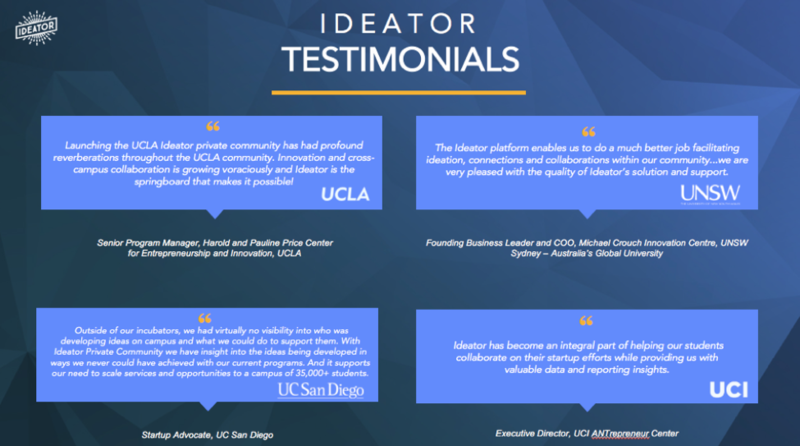 Ideator is working with some of the top innovative universities and corporations to help them solve problems just like this. We provide the technology platform, the tools, an engagement support team, and the innovation network that’s making it possible to create lasting and measurable impact in innovation and entrepreneurship education. If you have questions about how we do this, or if you’d like us to do this for you, we’d be happy to speak with you. Simply email Thomas Schutz at tom@ideator.com and we will schedule a time to talk and/or set up a demo at your convenience. We look forward to connecting with you and working together to make a difference.